The Samsung Galaxy Note 9 colours have been leaked today by renowned leaker, Evleaks. The device will be available in Black, Blue and Brown colours. This is slightly surprising, considering that a previous leak suggested that the Note 9 will be available in Black, Blue and Purple, at least in Europe. We also know that there is a mammoth 512GB variant, which will be available in Black and Blue colours. So, we are now looking at a total of a minimum of four Note 9 colours: Black, Blue, Brown and Purple. Here is another leaked render of the device, which was also leaked by Evan Blass. Of course, these are the first leaked press renders of the Note 9 colours. And they confirm the previously leaked designs of the phone. The Note 9 has horizontally placed dual cameras on the rear along with an LED Flash and a weird horizontally long fingerprint scanner just below the camera arrays. The display of the Note 9 is quite similar to that of the Galaxy S9, with no bezels on the side, thanks to the curved design. There is a bit of chin and forehead visible on the Note 9, and the display is noticeably wider as opposed to the narrower and taller display of the S9. But there is something else which we think is worth noting in the leaked photo of the Note 9 colours. The S-Pen of course. While the Black and Brown versions have matching colours for the S-Pens, the Blue one has a Yellow S-Pen which looks really flashy. It could annoy some people. 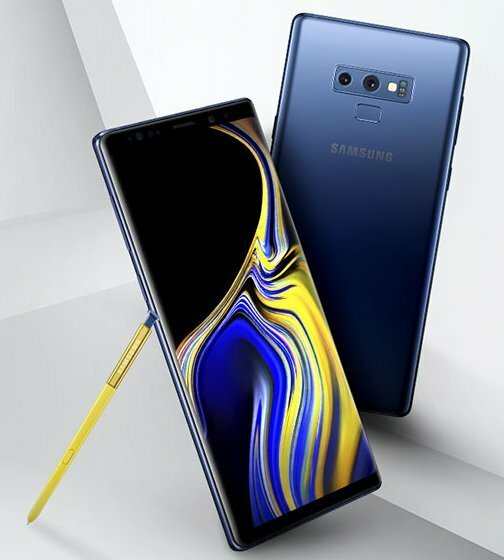 The Samsung Galaxy Note 9 will be launched on August 9th, so we can expect more leaks of the device, as the launch day draws nearer. The new S-Pen supposedly has Bluetooth functions for gaming, apart from the regular on-screen writing options for productivity.